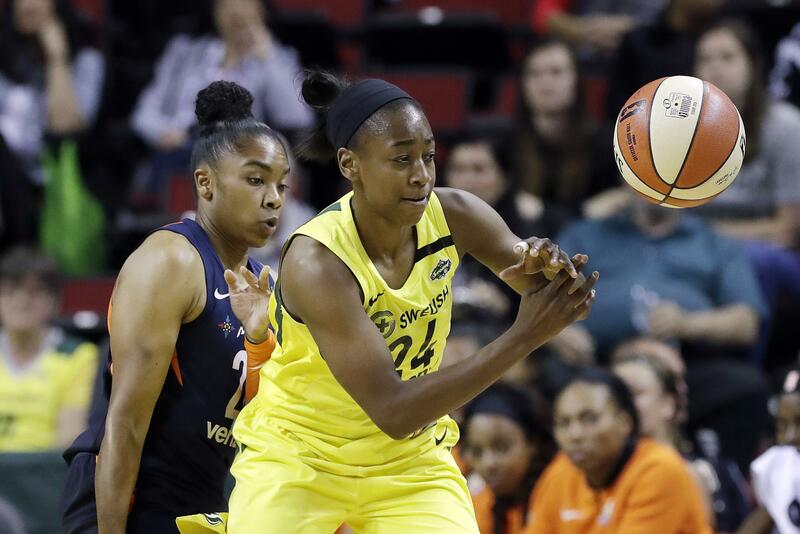 Tue., July 31, 2018, 9:44 p.m.
PHOENIX – Jewell Loyd scored 29 points with five 3-pointers, Natasha Howard had 15 points, 10 rebounds and five blocks, and the Seattle Storm beat the Phoenix Mercury 102-91 on Tuesday night. Loyd and Howard combined for 27 points in the first half as Seattle build a 53-44 lead. The Storm outscored Phoenix 28-16 in the third for an 81-60 advantage. Breanna Stewart added 16 points and eight rebounds for Seattle (20-7). Alysha Clark scored 15 points as 10 difference Storm players scored. Seattle shot 54.1 percent from the field, including 11 of 22 3-pointers. Brittney Griner had 25 points, six rebounds, seven assists and three blocks to lead Phoenix (15-12). Diana Taurasi scored 14 of her 20 points in the first quarter and DeWanna Bonner added 14 points on 5-of-14 shooting. Phoenix has lost seven of its last eight games, including four straight at home. Published: July 31, 2018, 9:44 p.m.